My Sister in Law passed this recipe on to me a couple of weeks ago, she's a bit (or a lot) of a whiz in the kitchen, and has been coming up with some great recipes for her one year old, and my brother who is the pickier of the two! I gave them a go today, and they were a hit for Ezra's lunch. I now also have a whole lot of meatballs left over, so guess what we are having for dinner tonight! They were a hit for me as well, I was going to freeze them, but decided against it. I'm really looking forward to dinner tonight, especially because it is all basically already ready! It's as simple as grating the carrot, chopping the spinach and coriander, crushing the garlic and adding those, plus everything else into a bowl. Then form the mixture into small meatballs. Serve with rice, pasta or steamed vegetables. You can also make up an easy dipping sauce for them with coconut milk, peanut butter and Tamari, incase your kids like mine are really, really obsessed with dips. As much as I like eating sandwiches, they do get a little boring and redundant for me. So I love having some quick and easy lunch recipes for me and the kiddo on hand, so that we don't have to have the same thing for lunch everyday. Is there anything interesting you have been creating to make lunches more exciting lately? 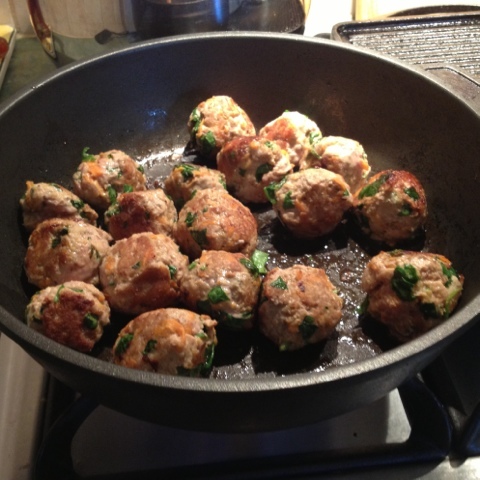 2 comments on "Satay Turkey Meatballs"
These look so good! I'd love to try them, but I'd have to find an alternative to peanut butter, since I'm allergic...still a great recipe though! Ok, no offense is meant towards you, and there is a positive side . BUT these are the absolute worst thing I have eaten in a long time. I'm not sure what it was. I think maybe if I added more seasoning? or... I honestly don't know. I just did not like them. Maybe I'm just more of a beef person. But, my 18 month old on the other hand GOBBLED them up. He is pretty picky, so I was shocked. I almost threw them out but let him try them first... Glad I didn't trash them! Lol. Crazy mixed review, but thanks for the recipe. I love when my son actually eats something!